The present paper documents the findings of phytosociological attributes which have been carried out in tropical moist deciduous forest of Kuldiha Wildlife Sanctuary, Odisha, India. The main objectives of this study are to identify, characterize and classify the vegetation community which is naturally distributed in the forest reserve. The vegetation sampling and data analysis were done following standard procedures. One hundred and eight plant species belonging to 38 families in the form of 38 species of trees, 38 species of shrubs and 32 species of herbs are documented. The most common plant species based on importance value in tree, shrub and herb layers are Terminalia tomentosa (IVI-292.27), Shorea robusta (RVI-50.89) and Croton roxburghii (RVI- 17.11) respectively. Euphorbiaceae is found to be most dominant family. The incidence of fire, livestock grazing and other anthropogenic disturbance are responsible for depletion of the old and uneven age structure of forest. This study provides baseline information on the dry forests of Kuldiha Wildlife Sanctuary. Appropriate conservation and management can considerably improve the botanical value of Kuldiha Wildlife Sanctuary, and consequently their value for other life forms. Fig. 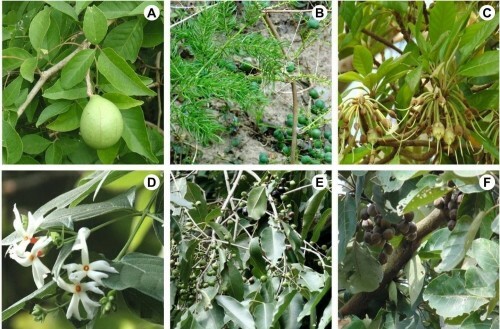 : Some medicinal plant species of Kuldiha Wildlife Sanctuary: A, Aegle marmelos (L.) Corr. ; B, Asparagus racemosus Willd. ; C, Madhuca indica Gmel. ; D, Nyctanthes arbor-tristis L.; E, Syzygium cumini (L.) Skeels; F, Terminalia bellirica (Gaertn.) Roxb.